Yeah, yeah. It's 7 weeks into 2016. But better late than never, eh??? It's no spoiler to say, flat out, that I didn't achieve most of my goals in 2015. But I did end up achieved more of them than I would have thought. I had decided that I wanted my goals to be both long-term and short-term, and give me different things I could focus on at different times... the idea being that I had the opportunity to achieve different types of success throughout the year. This one as such a damn stretch. And I didn't even come close. And, seriously, the races packed in at the end of the year provided many of the miles. I hope to do better in 2016. This was a big stretch -- I haven't run close to that pace in nearly 3 years now. Perhaps, I dunno, TRAINING for a race could make this achievable. But, since I was unable to force myself to train (sigh), and I kept getting small, hobbling injuries, I didn't come near this in 2015.. As in, fastest time was 2:22 and change. I do still think that on the right day, on the right course, I could hit it. Maybe 2016. Ahh, this. Another spectacularly poor performance in 2015. Even with a new system whereby I would grade myself on a percentage of weeks completed... well... I'm still getting a failing grade. I only had 15 weeks where I ran 15 or more miles ... So that's pretty grim. Not sure I can even pretend that I'll so something along this line in 2016. Nope. Though to be fair, in 2014 I would have thought this was a real long shot. Except when we "took it easy" at the Tinker Bell 10K in January 2014 and ran 1:02 and change. Then a month later I ran 1:01 and change. But I didn't really make the time to run any more 10Ks ... or work on my speed. I'm going to bring this back in 2016. 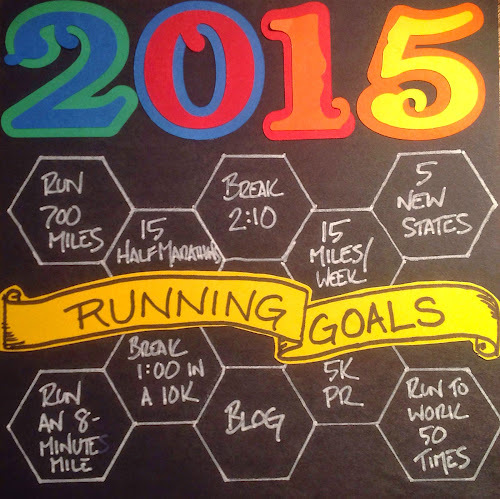 No speedy runs whatsoever in 2015 ... but I am gonna make this happen in 2016! Seriously, nada. Though I did walk to or from work about 30 times ... so this is on my radar and achievable, I think. Just gotta get on it in 2016. Fifteen... and then some. (Half marathon #15 was the Hartford Half Marathon, on 10/10/15.) I finished the year at 21 half marathons ... and a totally unexpected three FULL marathons. I'm super proud of this! Color this one done! Being able to run the Center of the Nation Series with Mainly Marathons and pick up 5 new states ... and then spend some time back east to run in three more ... with another state coming up in a couple of weeks. So happy to take such a big chunk out of the rest of the list. So, two big happy successes ... and a whole lotta failures. I want to streamline my goals for 2016 ... fewer goals, but still keep them spread across different types of goals. More to come on that! Princess Half Marathon costumes complete!! !